afrol News, 21 February - Yesterday's mass protests in Morocco, at first peaceful and tolerated by authorities, during the night turned violent, with 5 deaths and 138 injured. Anger is spreading and could cause new violence. Tens of thousands of Moroccans followed the calls for nation-wide pro-democracy protests yesterday, in mostly peaceful marches demanding reforms to establish a constitutional monarchy. The largest, previously allowed, marches were noted in the capital Rabat and in Morocco's largest city Casablanca. Protests here were marked by a good atmosphere and understanding between protesters - mostly intellectuals - and security forces. Some reports even say the protesters were rather timid in their demands, happy to be allowed to stage a peaceful protest with royal blessings. But in less advantaged areas, the tension soon built up. Especially in the regions dominated by the Berber minority - estimated at between 20 and 60 percent of the total population - the masses in the streets were different, displaying more anger and more hopelessness. This includes locations in the Atlas Mountains and the Rif northern coast; historically disadvantaged areas. In Marrakech - the unofficial Berber capital and a major tourist destination - more and more disillusioned youths took to the streets during the afternoon and evening in a seldom occasion to display their discontent. 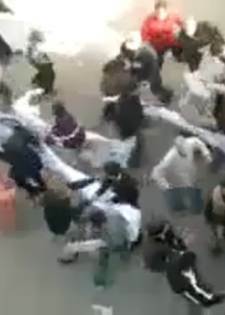 As the Marrakech protests increased in strength and determination, police decided to violently disperse the crowds of an estimated 2,000 persons. the site. Also, protesters tried to storm police headquarters in the city. Nobody was however injured. In northern Morocco, however, the situation got further out of control. In Larache, at the Atlantic coast, protesters also attacked local buildings after being dispersed by police. Here, several persons were wounded during the clashes. In Al-Hoceima, a small city at the Mediterranean coast without any major tourist impact, the heaviest clashes were registered. Few independent details are known, but clashes between protesters and riot police, reportedly using live ammunition, resulted in five deaths and over 100 injured during the night. According to Moroccan authorities, the incidents in Al-Hoceima had been a result of looting criminals. Interior Minister Taieb Cherqaoui today claimed the five deaths came after a group had tried to take advantage of the otherwise "peaceful protests" to rob a bank. They had been killed inside the bank, he added. Minister Cherqaoui admitted there had been violence in the cities of Tangier, Tetouan, Larache, Al-Hoceima, Sefrou, Marrakech and Guelmim, blaming all this on "sabotage acts perpetrated by troublemakers, including minors and ex-convicts." Independent sources from many of those cities mentioned however describe a different reality, claiming protesters had first been attacked by security forces. 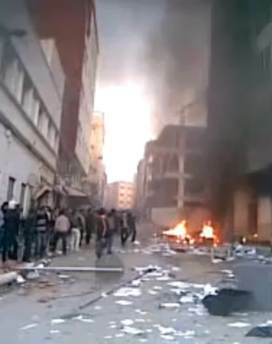 Anger was building up in these areas, which could become the basis for further spontaneous protests.